I am pleased to inform you that there are 6 new authors who have joined our IWW group during the month of October 2017. They are Suneet Paul, Deepali Sagar, Shreya Sathe, Arnab Kumar Roy, Anindita Bose, and Madirekshana Chakraborty. A hearty welcome to you all to our group. Thanks for joining our community. The submissions received late towards the end of the month could not be included in this issue. The chosen ones will be published during this month. 3. 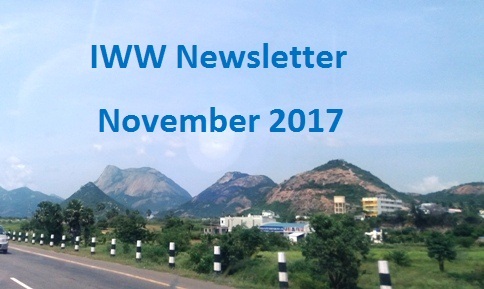 New items published at IWW in October 2017. (a) Love Lost and Found, (b) The Little Squirrel, (c) An Evening that was, (d) Jagaluru retained original name Jagadeeshpur, (e) Naked, Papa needs a Daughter, (f) Avatar- the Traffic man, (g) Management Guru and (h) Kinship knows no Boundaries. (a) The Backyard, (b) The Amorphous Blue Sky, (c) Nature, (d) It makes me Smile, (e) After Sleep, (f) Seeing them Fly, (g) Endless Love, (h) Set Me Free and (i) Word Thief. 3) Chicken Soup: The Empowered Woman http://www.chickensoup.com Deadline January 10, 2018. 4) Compelling Science Fiction http://compellingsciencefiction.com/guidelines.html Deadline December 1, 2017. At Compelling Science Fiction, we have two main goals: to find, publish, and promote the best science fiction stories, and to support and encourage the authors who write them. We currently pay 6 cents/word for accepted stories. Length 1,000 to 10,000 words. 5) Psychopomp Magazine Short Fiction Award https://psychopompmag.com/contests/ $10 ENTRY FEE. Deadline January 31, 2018. The Psychopomp Magazine Short Fiction Award recognizes outstanding pieces of fiction that push the boundaries of genre and/or form. First prize $500 and issue publication. Submit up to 6,000 words.